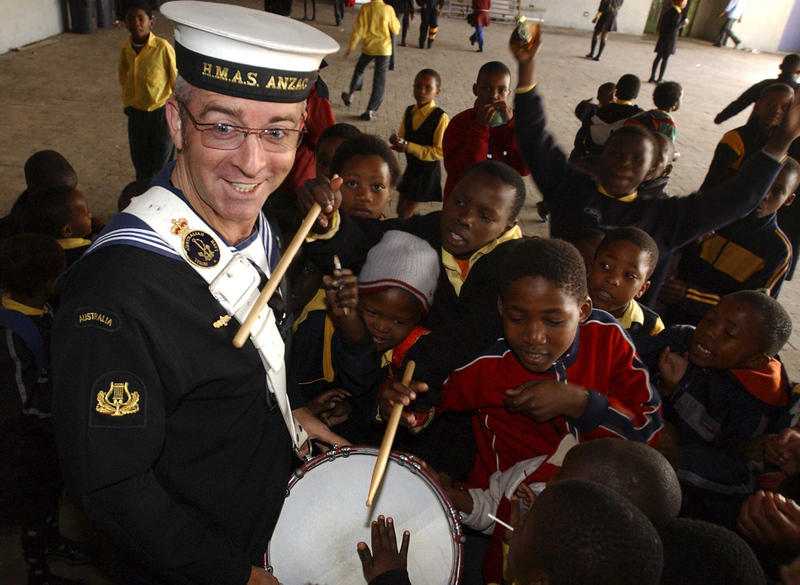 Able Seaman Damian Dowd with Students from Ukhanyo School in Masephumelele in South Africa. The Royal Australian Navy Band plays an invaluable role in keeping Navy's image in the public consciousness, and it maintains one of Navy's most consistent and significant public engagement profiles. Its musicians promote awareness in the wider community of Navy's critical contribution to the nation and reflect the quality of Navy's people and the values for which we all aspire. The band comprises two full-time detachments and four part-time detachments positioned across Australia, and is one of the few platforms in which Navy can deliver its message to the people of Australia. Its musicians also add significant value to deployments undertaken by major fleet units. Through ship borne deployments of small elements of musicians, the band provides personnel who are crosstrained in a range of mariner and non-category specific skills. This enables its musicians to make a very meaningful contribution to the capability of the ships that they join as well as adding value to the Fleet's engagement profile ashore. Navy's musicians have demonstrated a strong and proud record of service. Prior to and immediately after Federation, music was provided in the various state Navies by bands formed within the structure of each group. Whilst records are scarce, there are indications that in 1879 the Fremantle Naval Volunteers (sometimes referred to as the Fremantle Naval Brigade or Naval Artillery Volunteers) formed a fife and drum band. In 1893, the New South Wales Naval Brigade Band comprised 22 personnel. 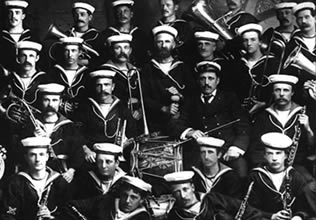 Another of the very early naval bands was the Band of the Victorian Naval Brigade. This band, which comprised personnel from the permanent service and Naval Brigade, deployed to China as part of the naval contingent that assisted in quelling the Boxer uprising, and was present (as a band of the Commonwealth Naval Force in 1901) at the arrival of the US Navy's 'Great White Fleet' into Port Phillip Bay in 1908. Members of the Victorian Naval Brigade Band that deployed to China as part of the Naval contingent that assisted in quelling the boxer uprising. Some months prior to the commissioning of HMAS Australia (I) at Portsmouth on 21 June 1913, six musicians (recruited in Melbourne) were sent to England to join up with a number of ex-Royal Marine and British Army bandsmen. These musicians, who formed the first band established under the title 'Royal Australian Navy', were kitted up in the Royal Marine uniform of the period and arrived in Sydney in HMAS Australia (I) on 4 October 1913. A second band was formed in 1927 for Flinders Naval Depot, now HMAS Cerberus. This band consisted of permanent musicians assisted by volunteers from all branches within the depot. By the late 1930s, in addition to bands in shore establishments, there was a rapid expansion in musician recruitment with a total of five bands at sea, serving in the cruisers Australia (I), Canberra (I), Hobart (I), Perth (I) and Sydney (II). During WWII, musicians served with distinction in HMA Ships in all theatres of war. To supplement their musical duties, they worked as gun crews, shell bearers in magazines, in transmitting stations, as first aid parties and as lookouts through day and night watches. Fatalities occurred, and given the fact that cruisers were prime enemy targets, musicians were among those unfortunate sailors who lost their lives in HMA Ships Perth (I), Australia (I), Penguin (I), Canberra (I) and Sydney (II). Musicians also saw action aboard the carrier HMAS Sydney (III) in Korean waters in 1953, and a total of 172 musicians served aboard HMA Ships Sydney and Melbourne (II) during the Vietnam conflict. These two bands also performed separate concert tours of South Vietnam in 1970. By 1973, the only band remaining afloat was serving aboard HMAS Melbourne, and this band transferred to HMAS Stalwart (II) on the decommissioning of the ageing carrier in mid-1982. Without a carrier, the ability of the band's musicians to serve at sea was very limited for a short while after 1982. Although the Navy's larger ships possessed some spare capacity when not conducting operations, the majority of the Fleet consisted of ships of frigate size and smaller, with little excess accommodation above the requirements of their crews. Nonetheless, after a brief absence, the band successfully renewed and reconfigured itself to take account of the changed environment, and re-established links with the Fleet through regularly embarking small musical ensembles for major deployments. Then as now, the musicians assisted in establishing strong morale within the ship in which they were embarked, as well as making a valuable contribution to the promotion of Navy's interests ashore with public performances. Leading Seaman musician Jason Beach performs at a concert held in Honiara to celebrate the second anniversary of the Regional Assistance Mission to the Solomon Islands. During these deployments, Navy's musical seafarers have been employed in a variety of roles including for general duties in cafe and laundry parties and in the galley, on watch in the bridge, on the helm, and as members of the ship's force protection teams. For Operation SLIPPER and Operation FALCONER the musicians worked as members of a Flight Deck Team in HMAS Kanimbla. The Commanding Officer, HMAS Arunta reported that his detachment of musicians 'significantly contributed to the Task Group achieving its goals of representing Australia to the nations of South East Asia'. He added further that 'in a Navy of pressing operational imperatives the detachment has proved a powerful weapon in winning the hearts and minds of the people in which they have been in contact'. His report is reflective of many other reports attesting to the value of embarking a detachment of musicians. During HMAS Anzac's visit to South Africa, one of the band's musicians sang at the rugby union match in Johannesburg between the Wallabies and the Springboks on 23 July this year. The performance was broadcast around the world and significantly raised Anzac's profile during her visit to South Africa. The deployment of 17 musicians to the Middle East Area of Operations during Christmas 2003 and the New Year 2004, as part of the musical Tour de Force sponsored by the Forces Advisory Council on Entertainment (FACE), demonstrated to Australian and Coalition forces the calibre of Navy's musicians as well as the band's impressive musical capability. During Anzac Day 2004 the band had 15 musicians at Cove and one of its buglers also performed at the Dawn Service in Baghdad. An element of the Navy Band performs during the 2005 Christmas Eve concert at Camp Smitty in Iraq. The band's role in supporting Australia's Regional Assistance Mission to the Solomon Islands, and its redeployment to the Middle East Area of Operations (MEAO) further enhanced the band's reputation. The deployment to the Solomon Islands in July, sponsored by the Forces Advisory Council for Entertainment (FACE), was a resounding success. 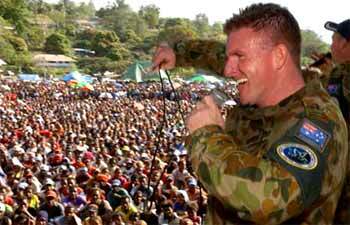 The highlight of the deployment was a concert in Honiara in front of more than 20,000 people. The band contingent comprised musicians from the Melbourne and Sydney detachments and presented a high energy program performed entirely from memory. The success of the redeployment to the MEAO during Christmas 2005 and the New Year 2006, also sponsored by FACE, should not be understated. The 19 strong contingent comprising members from the Melbourne and Sydney detachments, Defence Force School of Music and the Directorate of Music, completed 25 performances over a 16 day period in eight separate locations moving more than three and a half tonnes of equipment. This was in addition to the four days of in theatre military training. There were twelve major concerts (where civilian artists joined the band) with performance times ranging from one and a half hours to three hours. The entire program was performed from memory with a high level of choreography. An additional three and a half hours were required for the set up and pack down. Once again, Navy's musicians made a truly magnificent contribution to Australian and Coalition Forces during the important holiday season. 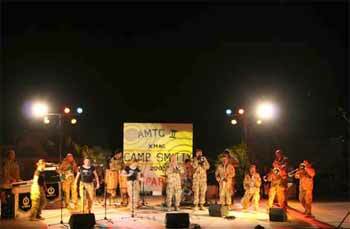 The band returned to the Solomon Island in 2007 for a second tour and to the MEAO in 2008 for its third tour; this time travelling within Afghanistan as well as throughout Iraq. Top: The combined South Australian and Western Australian Detachments on Parade for HMAS Canberra. Bottom: The Western Australian Detachment at the HMAS Sydney Memorial in Geraldton, WA. The deployment of 66 musicians to Brunei in July 2006, as part of the contribution by the Australian Defence Force to the celebrations marking the Sultan's 60th birthday showcased the band's ceremonial capabilities: the band stood alone in the quality and uniqueness of its presentation, which was warmly received and highly regarded. Of its 106 full time personnel the band has 27 members entitled to wear the Australian Active Service Medal, 11 of whom are also entitled to wear the Iraq campaign medal. Importantly, a high percentage of its people have served at sea and the band continues to provide a very impressive output for Navy at home and abroad. In Australia each year, the band completes more than 500 missions with audience numbers in the hundreds of thousands. Importantly, the band is able to keep Navy's image alive in communities far removed from any naval presence. Tasks range from supporting local community groups and ex-service associations to supporting ceremonial, public relations and social activities for the wider naval family. The Royal Australian Navy Band has performed on the shores of Gallipoli and in the bunkers of Vietnam, throughout Iraq and the Middle East, at the Royal Tournament and in Disneyland, at the Pope's summer palace (Castel Gandolfo), and in the 'Big Egg' Stadium in Japan. It supports Navy's regional engagement profile overseas and maintains a strong commitment schedule across Australia. These performances throughout Australia and the four corners of the world have created the proud traditions upheld by Navy's current generation of musicians. 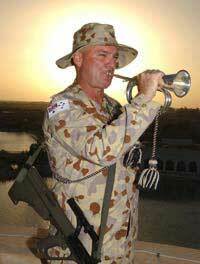 Chief Petty Officer Andrew Stapleton plays the Last Post at the Anzac Day Dawn Service in Baghdad 2004. ↑ Stevenson's Book of Quotations, Cassell, London, 1964, p. 1362. ↑ B Nicholls, Blue Jackets and Boxers, Allen & Unwin, Sydney, 1986, p. 45. ↑ The band changed from the Royal Marine uniform to the sailors uniform in 1960. ↑ Commanding Officer, HMAS Arunta, message dated 4 November 2003, para. 1. 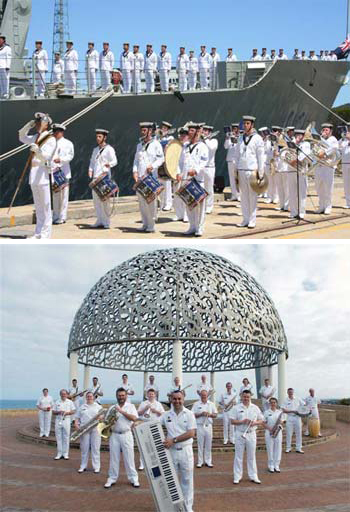 ↑ Royal Australian Navy Band Annual Report 2004/2005, July 2005, pp. 4-6. ↑ RW Gates, loc.cit., para. 3. ↑ B Nicholls, loc.cit., p. xi.